Travelling around Cuba can feel like you’ve stepped back in time – the iconic classic cars from the 1950s are everywhere, the architecture is from a bygone era and it’s perfectly normal to see a horse and cart in the street or a man using oxen to plough his field. The Cuban capital is a must for anyone visiting the country and the old, historic centre is easily explored on foot. Browse the second-hand books and posters for sale in the market in the Plaza des Armes (above), stop for a drink in Ernest Hemingway’s favourite bar La Bodeguita del Medio or step inside the beautiful Catedral de San Cristobal. The Plaza de la Revolución is a fascinating tribute to the revolution and the men who inspired it, with an incredibly tall monument dedicated to José Martí, a national hero in Cuba, at its centre (above). Before I went to Cuba, I was told if I did one thing in Havana, I should go to the Hotel Nacional and enjoy a cocktail on the veranda – I did and it was wonderful. Situated on the western tip of the island, Pinar del Río is best known for its cigars and rum. During my brief trip to the city, I visited Fábrica de Tabacos Francisco Donatién, a small cigar factory where I learned about cigar-making while watching the staff hand-rolling and cutting cigars, as well as a rum factory. Pinar del Río produces its own particular type of rum liqueur, guayabita (above), made from little guava fruits and is a must-try if you’re in the area. The beautiful Viñales Valley (above) boasts superb scenery thanks to the unusual and distinctive mogotes (the limestone rocks covered in lush green vegetation) that dot the landscape. There isn’t much to do in the town itself, but the countryside is well worth exploring. I had a wonderful time in Viñales walking through the countryside and meeting some of the local fruit and tobacco farmers. The southern coastal city of Cienfuegos is a UNESCO World Heritage Site thanks to its perfectly-preserved historic centre. Parque Marti in the middle of the city is surrounded by beautiful, historic buildings, including the Catedral de la Purisima Concepción and the Teatro Tomás Terry, which is well worth a look inside. With its enchanting bay-side location and historic centre, the city has been nicknamed the Pearl of the South. Walking around the centre of Trinidad can feel like you’re in another era thanks to its cobbled streets and colourful colonial-era buildings. This UNESCO World Heritage Site was my favourite place in Cuba. There’s a laid-back charm to the city and I happily spent a couple of days mooching around, popping into its shops, restaurants, museums and churches, browsing the handicrafts market, and soaking up its rich heritage and culture. If you like cocktails, make sure to visit Canchánchara, a small bar in the city that’s famed for its namesake cocktail – a delicious concoction of honey, rum, lime and water. And don’t miss the nightly Casa de la Musica on the stone steps beside the Plaza Mayor (above) where Trinidadians come to dance, listen to music and sip mojitos. If you’re looking to delve into Cuba’s revolutionary past, then head to Santa Clara. For the city was the site of the last, decisive battle in the revolutionary war of the 1950s. The Tren Blindado Monument recreates the train derailment, orchestrated by Ernesto ‘Che’ Guevara, that prevented the then-dictator Batista from moving his soldiers and weapons to the east of the country. The city is also where Ernesto ‘Che’ Guevara is buried and his burial site is surrounded by a jaw-droppingly enormous memorial, the Conjunto Escultorico Comandante Ernesto Che Guevara (above), that has to be seen to be believed. The site also includes a small museum dedicated to the guerilla leader. Cuba tends to have a bad (and unfair) reputation for its food. There’s a lot of pork, rice and beans on menus, but I feasted most nights on delicious platters of seafood. My favourite meal was lobster and shrimp with plantain chips and salad (which I ate a lot), but I also enjoyed a great paella, red snapper and a scrumptious tuna sandwich, which to my surprise consisted of a flavourful marinated tuna-steak and salad in a roll. The island is famous for its rum and the spirit beloved by sailors can be found everywhere – bottles of the ubiquitous Havana Club rum are incredibly cheap. Rum is most often drunk in cocktails – you’ll find piña coladas, daiquiris, cuba libres and mojitos on most drinks menus. But you’ll also find the odd local speciality, such as Trinidad’s Canchánchara cocktail (above), and Pinar del Río’s guayabita rum liqueur, too. To experience some Cuban hospitality, it’s worth staying in a casa particular, a private home that rents out rooms or apartments to paying travellers for the night. It’s a handy way for Cubans to earn a little extra money. I stayed in two casa particulares when I was in Cuba – one in Viñales, the other in Trinidad – and in both cases, my hosts were warm and friendly, and the accommodation excellent. They also served superb breakfasts in the morning. If you’re planning a trip to Cuba, it’s worth noting that you can’t buy Cuban money outside the country. And confusingly for first time visitors, the country has two currencies – the Cuban Peso, which is mostly used by Cubans, and the Cuban Convertible Peso (known as CUCs), which is mostly used by visitors. You can buy your CUCs from a kiosk at Havana Airport, as well as at banks and cadecas throughout the country. British Pound Sterling and Euros are accepted. It’s also worth bearing in mind that the country charges travellers a departure tax – so you’ll need to keep 25 CUCs aside to leave the country. Have you been to Cuba? If so, please feel free to share your travel tips in the comments below. I’d love to hear your thoughts about the island, too. Here are some of my favourite photos from Havana. First up, the courtyard at the Palacio de los Capitanes Generales. Basílica Menor de San Francisco de Asís. A statue (and a pigeon) in the Plaza de San Francisco. View across the rooftops of Old Havana. Bells in front of the Basílica Menor de San Francisco de Asís. Portrait of Ernesto “Che” Guevara in the Plaza de la Revolución. Another statue in the Plaza de San Francisco. “If you only do one thing when you’re in Havana, make sure you go to the Hotel Nacional and sit on the terrace with a cocktail,” I was told by a friend-of-a-friend at a wedding a few days before I went to Cuba. And it’s how I came to spend my final morning on the island, sipping a pina colada with the girls in the garden of this elegant hotel while looking out at the stunning views over the Bahia de la Habana. It was the perfect end to my trip following my previous day’s sightseeing around the Cuban capital. Havana is one cool capital city and the district of Old Havana exudes a faded glamour, part beautifully-preserved colonial buildings, part run-down and frayed. Head off the beaten track and you can soon find yourself in a street with enormous pot holes, the like of which I’ve never seen before, and semi-ruined buildings. But it has its own charm and is a fun place to explore on foot. One of the most interesting parts of the city is the old book market in the Plaza de Armas (above), where you can buy second-hand books (some of which are in English) and posters, including those of Cuban films and propaganda for the communist government. There are also lots of fascinating shops round about selling unique paintings, as well as some of the usual tourist goods such as clothing, toys and musical instruments. The famous La Bodeguita del Medio, which was frequented by Ernest Hemingway, is filled with photographs of its notable patrons and the walls are covered in graffiti where the bar and restaurant’s visitors have scrawled their signatures. It’s small, cramped and very busy, but I stop off for lunch in the restaurant at the back of the establishment and enjoy a good, hearty meal, along with an obligatory mojito. In the afternoon, I head to the Memorial José Martí (above), an enormously tall star-shaped tower in the centre of Havana’s Plaza de la Revolución dedicated to the Cuban writer and political activist. The surrounding square also features massive portraits of Che Guevara and fellow guerilla Camilo Cienfuegos on the sides of two buildings. It’s anything but subtle – but a fascinating sight to come across in the middle of a capital city. An impromptu flamenco show at a restaurant in Old Havana livens up my evening as I enjoy a spectacular dancing show right in front of my table during dinner. It’s a fun way to spend the first half of my night before heading down the street to see the iconic Buena Vista Social Club at the Café Taberna. Despite the fact that most of the performers seemed to be in their 70s or there abouts, they put on an incredible show singing, playing their instruments and dancing, and the audience was soon up on their feet dancing along. It was an incredible evening and I left the café unable to get Cuba’s unofficial national anthem, Guantanamera, out of my head. Images of Ernesto “Che” Guevara abound throughout Cuba, but I was taken aback by the sheer scale of the Conjunto Escultórico Comandante Ernesto Che Guevara memorial dedicated to the revolutionary doctor at the Plaza de la Revolución in Santa Clara. It’s staggering and an impressive sight. At the heart of the giant memorial is an enormous statue of the guerilla that sits atop a tall plinth (above). Underneath the memorial is an interesting museum dedicated to Che’s life, featuring biographical information, intimate photographs of him, as well as some of his belongings. There’s also a poignant mausoleum where Che, his mother and 38 of his comrades from Bolivia are buried. Their remains are interred in a cave with a jungle setting and each comrade has his own dedicated memorial. At the far end of the cave, an eternal flame marking their sacrifice – and lit by Fidel Castro – burns. Santa Clara is also the site of one of the most decisive battles of the Cuban revolution of the 1950s. The Tren Blindado Monument (above) in the city is a series of train carriages and concrete statues of explosions that’s dedicated to the train derailment masterminded by Che Guevara in December 1958, which allowed him to conquer the city. Inside the train carriages are artefacts from the derailment. Situated next to the railway line where the battle took place, it’s a clever and effective way of commemorating the event as it imaginatively captures how it unfolded. The old city of Sancti Spíritus was founded by the conquistador Diego Velázquez in 1514. Originally situated on the Tuinucú river, in 1522 it was re-established on the river Yayabo, where it still stands today. It’s a pretty, relaxed city and a great place to spend a few hours mooching around, wandering into the little shops and sitting on the terrace of a bar, sipping cocktails and watching the world go by. Here are some of my favourite photos of Cienfuegos, starting with this pretty building on a street corner near Parque Marti. A bandstand in the centre of Parque Marti. A monument in Parque Marti. A plaque of a compass on the ground in Parque Marti. Another monument in Parque Marti. Nicknamed the “Pearl of the South”, the city of Cienfuegos on the southern coast of Central Cuba boasts a beautiful bay and some picture-perfect architecture. The centre of Cienfuegos is a UNESCO World Heritage site and is home to some spectacular old colonial buildings. Some of the most notable examples are situated around the central square, Parque Marti, including the Tomás Terry Theatre, the Catedral de la Purisima Concepción and the Provincial Museum. The Tomás Terry Theatre is named after the super-rich 19th century sugar baron, slave trader and mayor Tomás Terry. Built in the late 1880s and brilliantly preserved, when you step inside, it feels as though you’re stepping back in time. The theatre is incredibly beautiful with a fabulous painted ceiling and I was taken by how different the seats are compared to the theatres in the UK. Instead of cramped velvet seats, the circular auditorium features rows of wooden seats and its walls are lined with boxes of wooden seats. Sadly, I didn’t get a chance to take in a performance at the theatre, but it was such an elegant and refined setting that I would have loved to have been able to do so. The Provincial Museum (above), meanwhile, is a curious little place. The charming museum (it’s displays are all in Spanish) attempts to convey the history and culture of Cienfuegos. It has only a few small galleries but each one varies wildly – the ground floor is filled with archaeological and evolutionary artefacts, including an ancient human skeleton that was found in Cuba, while the first floor displays modern art, as well as artefacts from the 19th and 20th centuries. Tear five or six mint leaves into a mortar, add the lime juice and the sugar, then use a pestle to grind the ingredients together until the mint breaks down. 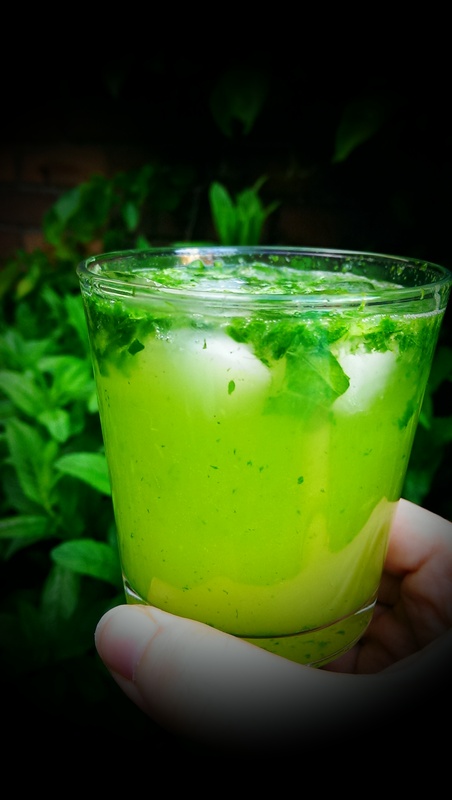 Pour into a glass, add a spring of mint, a good glug of rum and the same amount of lemonade. Give it all a good stir, then add the ice. Serve and enjoy. View from the Iglesia y Convento de San Francisco bell tower. A horse on the streets of Trinidad. The ruined Iglesia de Santa Ana. A horse and cart on the cobbled streets of Trinidad. The bell tower at the Iglesia y Convento de San Francisco. A caged bird outside a house in Trinidad. Looking towards the Iglesia y Convento de San Francisco.